Become a world-class expert to your colleagues, customers and company, with the appropriate skills and accreditation needed to succeed. Polarion’s Certification Program provides you with a strong foundation of knowledge, experience, and confidence for your personal journey to Application Lifecycle Management expertise. A Polarion certificate demonstrates your dedication to being the best in your industry, staying up-to-date with Polarion’s ALM products and eventually improve your value as an employee or consultant. Registration is easy! Type your e-mail address and pay with PayPal or a credit card. When payment is done, you will receive an e-mail with login information. Registration is easy! Type your e-mail address and pay with PayPal or a credit card. When the payment is done, you will receive an e-mail with login information. Certification demonstrates an in depth understanding of the principles and techniques necessary to use Polarion in the requirements management domain. The Polarion Certified Solutions Professional is proficient in following areas. … for more details please see "Preparation"
The following training modules & materials are recommended before taking the test. Certification demonstrates an in depth understanding of the principles and techniques necessary to use Polarion in the test management domain. The Polarion Certified Solutions Professional is proficient in following areas. Certification demonstrates an in depth understanding of the principles and techniques necessary to use Polarion in the application lifecycle management domain. 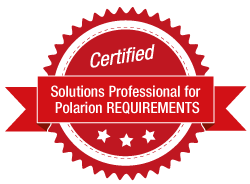 The Polarion Certified Solutions Professional is proficient in following areas. 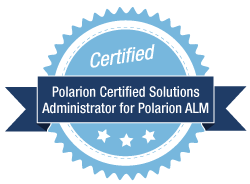 Certification demonstrates an in depth understanding of the principles and techniques necessary to configure and customize Polarion combined with a profound knowledge about how to use Polarion from an end user perspective.